I started making this shawl almost 2 weeks ago, and will probably finish tonight. The shawl is cast on at the bottom with 379 stitches, and knit up to the top decreasing at the outer edges, and a double decrease at the center. 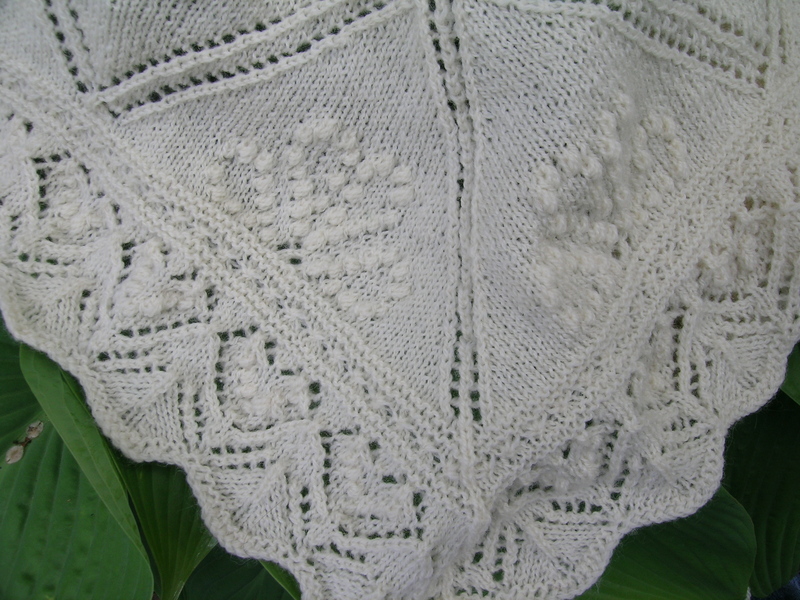 It has lots and lots of Nupps (nupp rhymes with soup), many more than on most Estonian shawls that I have seen, but that is what gives it the lovely heart-shaped patterns. The heart shapes will really stand out after it has been blocked. 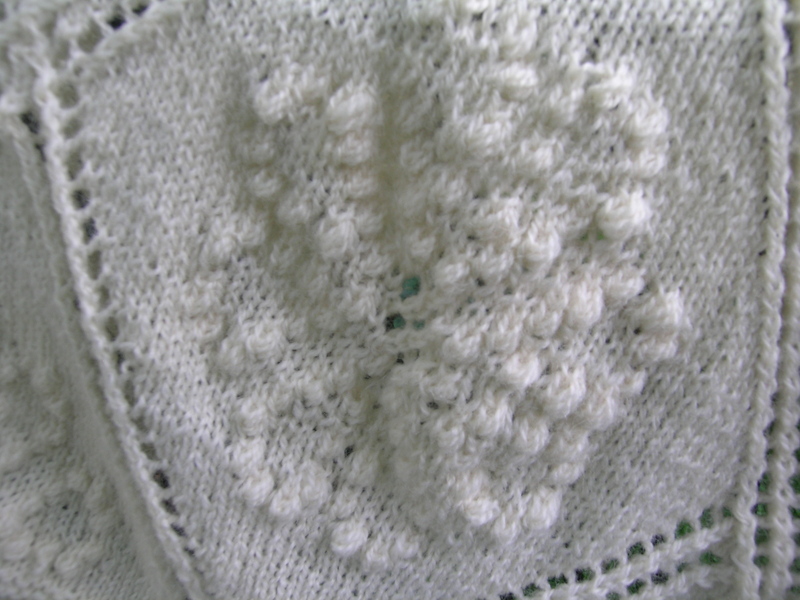 A nupp is a series of stitches knit into one stitch on the knit side, in this case a 5 stitch Nuup (K, YO,K, YO, K), and then purled together on the back side. This is where I ran into a few problems at first. When knitting the Nupps, you have to do it VERY loosely, and then on the purl side make sure that you catch them all together. If you recheck on the next knit row, you can pick up any errant loops that were not knit together. If you wait, then you have to take a darning needle, some spare yarn, and hook the loop and secure on the back. I have one whole row near the beginning where I missed about 6 loops, I think that it might have involved wine drinking. Discovered way too late to rip back, so I have a bit of repair to do prior to blocking. During my 3 days of knitting class last week, I made great progress on the shawl. It is nice that the stitch count is reduced by 4 stitches every other row, progress speeds up rapidly. Oh whatt a beautiful creation! I just roared at your line: “I have one whole row near the beginning where I missed about 6 loops, I think that it might have involved wine drinking. ” I LOVE wine, fruit of the vine!!!! I bow to your unmeasurable knitting talent!